Can you run GUI applications in a Docker container? How can you run GUI applications in a Docker container? Are there any images that set up vncserver or something so that you can - for example - add an extra speedbump sandbox around say Firefox? The Xauthority file can be written in a way so that the hostname does not matter. We need to set the Authentication Family to 'FamilyWild'. I am not sure, if xauth has a proper command line for this, so here is an example that combines xauth and sed to do that. We need to change the first 16 bits of the nlist output. The value of FamilyWild is 65535 or 0xffff. I just found this blog entry and want to share it here with you because I think it is the best way to do it and it is so easy. docker build -t firefox . of course you can also do this in the run command with sh -c "echo script-here"
With docker data volumes it's very easy to expose xorg's unix domain socket inside the container. This of course is essentially the same as X-forwarding. It grants the container full access to the xserver on the host, so it's only recommended if you trust what's inside. Note: If you are concerned about security, a better solution would be to confine the app with mandatory- or role-based-access control. Docker achieves pretty good isolation, but it was designed with a different purpose in mind. Use AppArmor, SELinux, or GrSecurity, which were designed to address your concern. This allows you to package many gui apps in docker. Firefox and emacs have been tested so far. With firefox, webGL doesn't work though. Chromium doesn't work at all. EDIT2: In the time since I first posted this, subuser has progressed greatly. I now have a website up subuser.org, and a new security model for connecting to X11 via XPRA bridging. Jürgen Weigert has the best answer that worked for me on Ubuntu, however on OSX, docker runs inside of VirtualBox and so the solution doesn't work without some more work. I'd appreciate user comments to improve this answer for OSX, I'm not sure if socket forwarding for X is secure, but my intended use is for running the docker container locally only. Also, the script is a bit fragile in that it's not easy to get the IP address of the machine since it's on our local wireless so it's always some random IP. I'm able to get xeyes and matplotlib working with this approach. Here's a lightweight solution that avoids having to install any X server, vnc server or sshd daemon on the container. What it gains in simplicity it loses in security and isolation. It assumes that you connect to the host machine using ssh with X11 forwarding. So that the forwarded X server port on the host is opened on all interfaces (not just lo) and in particular on the Docker virtual interface, docker0. The container, when run, needs access to the .Xauthority file so that it can connect to the server. In order to do that, we define a read-only volume pointing to the home directory on the host (maybe not a wise idea!) and also set the XAUTHORITY variable accordingly. It breaks container isolation due to some X security leaks. For example, keylogging with xev or xinput is possible, and remote control of host applications with xdotool. Applications can have rendering glitches and bad RAM access errors due to missing shared memory for X extension MIT-SHM. (Can also be fixed with isolation degrading option --ipc=host). Below an example script to run a docker image in Xephyr that addresses this issues. It avoids X security leaks as the docker applications run in a nested X server. MIT-SHM is disabled to avoid RAM access failures. Container security is improved with --cap-drop ALL --security-opt no-new-privileges. Also the container user is not root. An X cookie is created to restrict access to Xephyr display. The script expects some arguments, first a host window manager to run in Xephyr, second a docker image, optionally third an image command to be executed. To run a desktop environment in docker, use ":" instead of a host window manager. Closing Xephyr window terminates docker container applications. Terminating the dockered applications closes Xephyr window. # Xephyrdocker:     Example script to run docker GUI applications in Xephyr. 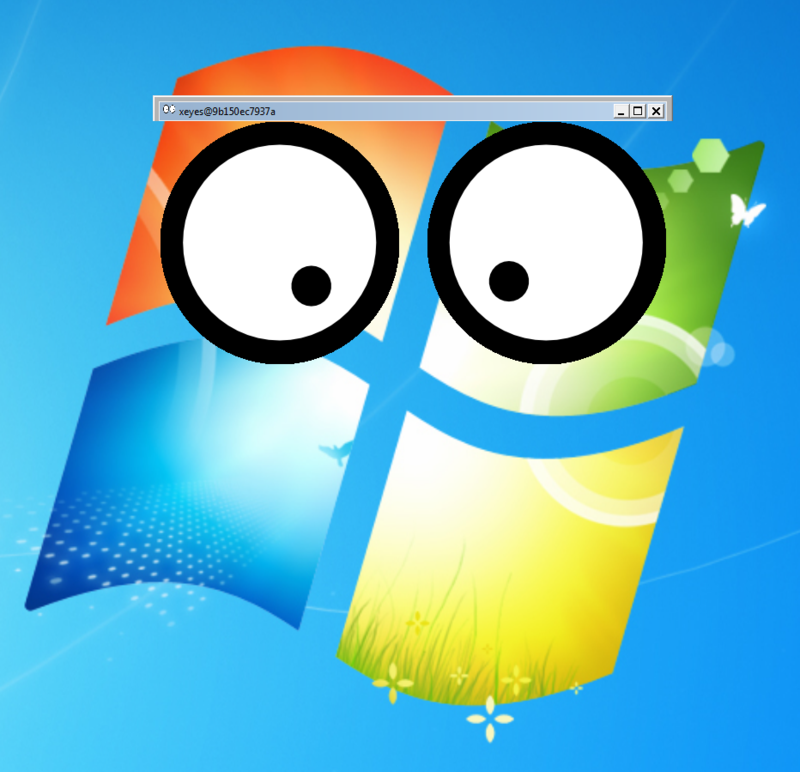 # WINDOWMANAGER     host window manager for use with single GUI applications. #                   To run without window manager from host, use ":"
[ "$Useruid" = "0" ] && Useruid=1000 && Usergid=1000 && Username="user$Useruid"
[ -e "$Cachefolder" ] && rm -R "$Cachefolder"
# --rm                               created container will be discarded. echo "# set environment variables to new display and new cookie"
echo "# same keyboard layout as on host"
echo "echo '$(setxkbmap -display $DISPLAY -print)' | xkbcomp - :$Newdisplaynumber"
echo "# create new XAUTHORITY cookie file"
echo "xauth add :$Newdisplaynumber . $(mcookie)"
echo "# create prepared cookie with localhost identification disabled by ffff,"
echo "# needed if X socket is shared instead connecting over tcp. ffff means 'familiy wild'"
echo 'Cookie=$(xauth nlist '":$Newdisplaynumber | sed -e 's/^..../ffff/')"
echo "# run window manager in Xephyr"
echo "# show docker log"
This script is maintained at x11docker wiki. A more advanced script is x11docker that also supports features like GPU acceleration, webcam and printer sharing and so on. This is not lightweight but is a nice solution that gives docker feature parity with full desktop virtualization. Both Xfce4 or IceWM for Ubuntu and CentOS work, and the noVNC option makes for an easy access through a browser. It runs noVNC as well as tigerVNC's vncserver. Then it calls startx for given Window Manager. In addition, libnss_wrapper.so is used to emulate password management for the users. The solution given at http://fabiorehm.com/blog/2014/09/11/running-gui-apps-with-docker/ does seem to be an easy way of starting GUI applications from inside the containers ( I tried for firefox over ubuntu 14.04) but I found that a small additional change is required to the solution posted by the author. While the answer by Jürgen Weigert essentially covers this solution, it wasn't clear to me at first what was being described there. So I'll add my take on it, in case anyone else needs clarification. First off, the relevant documentation is the X security manpage. Numerous online sources suggest just mounting the X11 unix socket and the ~/.Xauthority file into the container. These solutions often work by luck, without really understanding why, e.g. the container user ends up with the same UID as the user, so there's no need for magic key authorization. First off, the Xauthority file has mode 0600, so the container user won't be able to read it unless it has the same UID. Even if you copy the file into the container, and change the ownership, there's still another problem. If you run xauth list on the host and container, with the same Xauthority file, you'll see different entries listed. This is because xauth filters the entries depending on where it's run. The X client in the container (i.e. GUI app) will behave the same as xauth. In other words, it doesn't see the magic cookie for the X session running on the user's desktop. Instead, it sees the entries for all the "remote" X sessions you've opened previously (explained below). Otherwise, xauth tags it in a way that it's only seen outside the container. Where . represents the MIT-MAGIC-COOKIE-1 protocol. Note: There's no need to copy or bind-mount .Xauthority into the container. Just create a blank file, as shown, and add the cookie. Jürgen Weigert's answer gets around this by using the FamilyWild connection type to create a new authority file on the host and copy it into the container. Note that it first extracts the hex key for the current X session from ~/.Xauthority using xauth nlist. Extract the hex key of the cookie for the user's current X session. Create a new Xauthority file in the container, with the container hostname and the shared hex key (or create a cookie with the FamilyWild connection type). I admit that I don't understand very well how FamilyWild works, or how xauth or X clients filter entries from the Xauthority file depending where they're run. Additional information on this is welcome. If you want to distribute your Docker app, you'll need a start script for running the container that gets the hex key for the user's X session, and imports it into the container in one of the two ways explained previously. An X client (i.e. GUI application) running in the container looks in the Xauthority file for a cookie entry that matches the container's hostname and the value of $DISPLAY. If a matching entry is found, the X client passes it with its authorization request to the X server, through the appropriate socket in the /tmp/.X11-unix directory mounted in the container. Note: The X11 Unix socket still needs to be mounted in the container, or the container will have no route to the X server. Most distributions disable TCP access to the X server by default for security reasons. The SSH server running on a remote machine emulates its own X server. It sets the value of $DISPLAY in the SSH session to point to its own X server. It uses xauth to create a new cookie for the remote host, and adds it to the Xauthority files for both the local and remote users. When GUI apps are started, they talk to SSH's emulated X server. The SSH server forwards this data back to the SSH client on your local desktop. The local SSH client sends the data to the X server session running on your desktop, as if the SSH client was actually an X client (i.e. GUI app). The X server uses the received data to render the GUI on your desktop. At the start of this exchange, the remote X client also sends an authorization request, using the cookie that was just created. The local X server compares it with its local copy. If you want to run a GUI application headless, then read here. What you have to do is to create a virtual monitor with xvfb or other similar software. This is very helpful if you want to run Selenium tests for example with browsers. Something not mentioned anywhere is that some software actually themselves use sand-boxing with Linux containers. So for example Chrome will never run normally if you don't use the appropriate flag --privileged when running the container. There is another solution by lord.garbage to run GUI apps in a container without using VNC, SSH and X11 forwarding. It is mentioned here too. On a Mac, you can just access it using the Screen Sharing (default) application, connecting to localhost:5901. # Install Java, Open SSL, etc. Check the linked readme for build and run commands if you want/need. The only difference is that it creates a directory $XAUTH_DIR which is used to place $XAUTH file and mount $XAUTH_DIR directory instead of $XAUTH file into docker container. The benefit of this method is that you can write a command in /etc/rc.local which is to create a empty folder named $XAUTH_DIR in /tmp and change its mode to 777. When system restart, before user login, docker will mount the $XAUTH_DIR directory automatically if container's restart policy is "always". After user login, you can write a command in ~/.profile which is to create $XAUTH file, then the container will automatically use this $XAUTH file. Afterall, the container will automatically get the Xauthority file every time the system restart and user login. For other OpenGL implementations, make sure the image has the same implementation as the host. The other solutions should work, but here is a solution for docker-compose. To fix that error, you need to pass $DISPLAY and .X11-unix to docker, as well as grant the user who started docker access to xhost. Similar to @Nick's answer, but his solution did not work for me. I was also able to launch CLion from my debian docker container too. you may ask, whats the point to use docker if so many things are the same? well, one reason I can think of is to overcome the package depency hell (https://en.wikipedia.org/wiki/Dependency_hell). So this type of usage is more suitable for developer I think. Not the answer you're looking for? Browse other questions tagged x11 sandbox docker vnc or ask your own question. How do I get into a Docker container's shell? How to make Xvfb display visible? Access Windows 2016 Server Container (Docker container) via GUI? How can I develop in docker container with intellij? How does one remove an image in Docker? What is the runtime performance cost of a Docker container?